End of season means real savings for our gardeners. All perennials (**except Mums, Hostas, Kale & Daylilies) on sale at 35% off (no coupon required). Fall has distinct planting benefits. Autumn’s cooler air temperatures are easier on both plants and gardeners. The soil is still warm and there is time to allow the roots to develop before the freeze. Some good ideas include: daffodils, hyacinths, or peonies. These offers are good through October! See you this Fall! Check our Seasonal Tips blog for more about planting perennials in Fall. ARE GOOD THROUGH THE END OF OCTOBER! 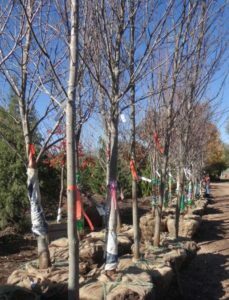 35% off Ball & Burlap Trees!